You’ve got your website all set up and now your ready to advertise it so that millions of people will see it. The web is full of “Let Me Blast IT!” services that promise to advertise your website to millions of viewers, but that’s not going to help much if the viewers aren’t the least bit interested in what your website is about. Instead of throwing your money down the drain on useless website views, you need to create a digital event to ATTRACT REAL VISITORS who are SERIOUSLY EXCITED about what you have to offer. What IS A Digital Event And How Do I Create It? A digital event is a uniquely packaged campaign that will be of HIGH INTEREST to your target audience. This digital event could be packaged in the form of an eBook, a webinar series, videos, live personal training calls, an email course, etc. As you package your digital event, you’ll want to include links that lead customers to your main website. This is a critical step to get the traffic you’re seeking! Whatever method you decide to use to package your event, be sure to load it with quality content that will be genuinely beneficial for your customers. Once the content of your digital event is all complete and ready to go, you’ll need to have a really nice promotional landing page set up to help sell it. 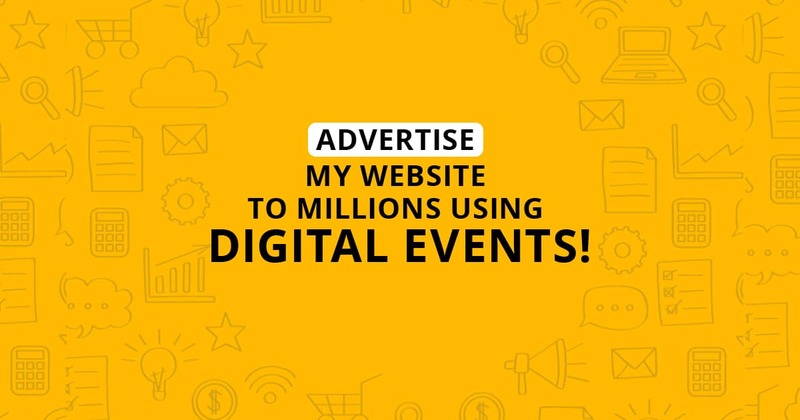 The process of creating and setting up your digital event does take some work, but if advertising your website to millions of viewers is your goal, this is the absolute BEST WAY to get targeted visitors that WANT to give you money. If you’d like to pass on setting up your digital event yourself and would rather someone else do it, contact us, we’d be more than happy to help with your project. How To Use An ARMY OF SALESPEOPLE To Advertise Your Website To Millions! Now that you have your digital event ready-to-go and your promotional landing page setup, it’s time to get it in front of millions of high-quality viewers! You’re going to hire your very own “sales team” to advertise your digital event. This “sales team” is a group of individuals who have their own blogs, websites, email lists, social networks, etc. And they will aggressively share your website all over the internet. They don’t work for free, but they’ll only get paid if and when they generate a sale for your digital event. To access this team of online sales soldiers, you simply have to add your digital event to ClickBank. ClickBank is an online retailer that partners “vendors” that have a product like you with “affiliates” that make money selling products like yours. By adding your digital event or “product” to ClickBank, you’ll INSTANTLY connect with thousands of affiliates who’ll see your product and decide if they’d like to sell it to their followers. To demonstrate, if your digital event(product) attracts just 10 affiliates who can each reach 10,000 viewers, your product has the opportunity of being seen by 100,000 people! Obviously, your actual results could be more or less depending on your specific digital event and how well it’s packaged. But if you did a great job of packaging your digital product and the affiliates LOVE IT, you could get hundreds of people working to advertise your product to millions. And once your digital product is listed on ClickBank it will stay indefinitely, meaning month after month new affiliates will see it and help you promote it. If you complete all of the tasks suggested in this article, you won’t ONLY know the answer to “How to advertise my website to millions?”, you’ll also have a digital event that will create additional profits for your bank account! Need a digital event solution to reach your local community? Download our eBook The Event Entrepreneur and learn how to get more customers!